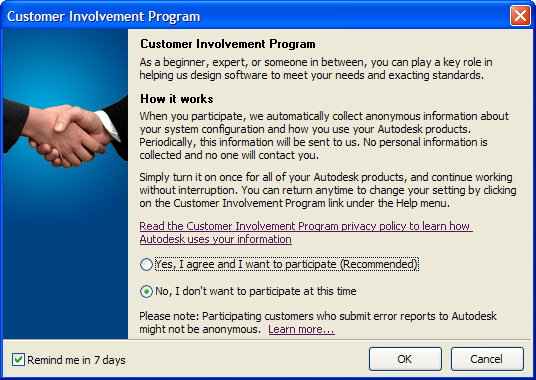 Autodesk Customer Involvement Program (CIP) is something new in AutoCAD 2008 based products and I guess some will raise their voice against it or being uncomfortable about it but I suggest that you participate. If you choose to participate in the Customer Involvement Program, AutoCAD will automatically send Autodesk information about what features you use most, any problems that you encounter, and other information helpful to the future direction of the product. You can choose to participate or stop participating at any time by accessing the Customer Involvement Program dialog in the product help menu or use the new long command CustomerInvolvementProgram. Your choice applies to all Autodesk products installed on the computer your choice is made. If you have answered yes to participate it is saved in the registry. As you can see it is not related to any Autodesk product or version. Either it is enabled or it is not. This setting can also be set using the updated CAD Manager Control Utility.